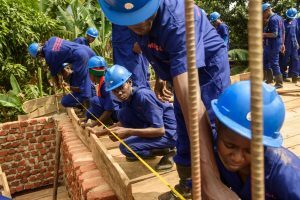 This team of u-learn participants are learning to build a hostel under the mentorship of Patrick Frank Miiro of Miiro Electric Services and Civil Engineering in Jinja, Uganda. They are trained in cement mixing, bricking, slabbing, mortaring, and electrical installation. Africa is the youngest and fastest growing continent in the world. By 2030, there will be 375 million young people in the job market in Africa.Within a few decades, this demographic boom will push Africa’s workforce to more than a billion people, the largest in the world. While economic growth in many countries has been strong over the last 10 years, it has come with relatively few employment opportunities. According to the International Labour Organization, almost 80 percent of people in Africa work informally. Recent research undertaken by our Foundationin two countries in Africa found that amongst young people, very few had access to formal employment and most struggled to make a decent salary to live. When young people can secure formal work and a steady wage their lives improve. Employment, particularly formal employment, is a leading pathway out of poverty for families. In Africa, the world’s youngest continent, youth employment is a particularly important measure of poverty reduction. This generation is healthier and better educated than their parents. Through technology, they have easier access to information, and consumer goods and services. The world they live in is more democratic. While the circumstances of their lives are measurably better than they were in the past, a significant gap between the number of young people seeking work and the limited employment opportunities available to them means that they will face challenges finding formal employment, and a pathway out of poverty. Moreover, for some time we’ve observed a mismatch between the skills of young people entering the workforce and the needs of employers. The youth employment challenge is daunting, but it is not insurmountable. We see the challenge of youth employment in Africa as an immense opportunity. Africa’s young people are innovative and energetic, and they are already creating solutions to the challenges they face. The time is right for the Foundation to focus on supporting them by driving systematic change in financial inclusion and education to increase youth employment and reduce poverty. That is why our goal is, by 2030, to enable 30 million young people, particularly women, to secure employment that they see as dignified and fulfilling. Design country-specific strategies:Improving education and vocational training. Finding new ways to connect people with opportunity, and increasing financial inclusion are all a part of the solution to the youth employment challenge. In addition, our approach will reflect the unique challenges and opportunities of the countries in which we work. Empower young women:Young women face additional, gender-based barriers in skills development and in accessing work. Breaking down these barriers is essential to their success, and ours. Work with more African organizations:On-the-ground knowledge and expertise is the bedrock of the Foundation’s work. Partnering with African-led organizations active in seeking solutions to youth employment is a priority. Use technology to drive impact and scale:Technology has the power to connect young people to their first job, apprenticeships, and cooperative programs. It also enables faster, more efficient access to capital, talent, and business support for entrepreneurs. It drives growth, inclusion, and poverty reduction. Share more evidence-based knowledge and innovation:In a rapidly changing work environment, data-driven, creative solutions are needed. We will find new insights and share them with others to magnify our impact. Young people want to drive change. They want to be more than just beneficiaries of programs; this generation wants to be job creators. Their input is critical in the development of programs, policies, and decisions that affect youth employment. They have a vision for a more inclusive future. Over and over, young people have told us to be bold in our goals. Young women, rural youth, and refugees face additional barriers in gaining employment. The Foundation will do more to break down walls of inequality and empower the most vulnerable young people to succeed. They believe in the power of innovation and technology. Young people not only want to be equipped with the skills they need to leverage current technology, they want to lead in the development of the technology of tomorrow. To that end, we will bolster support to Science, Technology, Engineering and Mathematics (STEM) education as we move forward. In light of the scale and complexity of Africa’s youth employment challenge, no one organization can address it alone. We must programme holistically and work with African governments, private sector, educators, and other funders. More cooperation with the formal private sector will be needed as well as increased levels of financial inclusion. The modernization of the agricultural sector and other critical growth sectors is key. Supporting African institutions to advance change in individual countries will be essential, as will advancing global discussions on youth employment in Africa. The Mastercard Foundationseeks a world where everyone has the opportunity to learn and prosper. The Foundation’s work is guided by its mission to advance learning and promote financial inclusion for people living in poverty. One of the largest foundations in the world, it works almost exclusively in Africa. It was created in 2006 by Mastercard International and operates independently under the governance of its own Board of Directors. The Foundation is based in Toronto, Canada. For more information and to sign up for the Foundation’s newsletter, please visit www.mastercardfdn.org Follow the Foundation at @MastercardFdn on Twitter. Action Research to find out “What Works” in Youth Job Creation?